Although no one knows for sure whether it was the Scots or the Irish who invented whisky, it dates back long enough to perhaps have had an inspiring effect regarding myths and legends of the Highlands and the Emerald Isles. It's written that Henry II, after a brief, surprise (thus uninvited) visit to Ireland in 1174, alluded to aquae vitae (Uisge beatha in Gaelic). Many minds must have been blissfully numbed since then, thus helping to account for the wealth of tales of leprechauns, fairies, loch monsters, seal-people and dragons. But who knows? Sometimes there's a very thin line between myths and reality.. 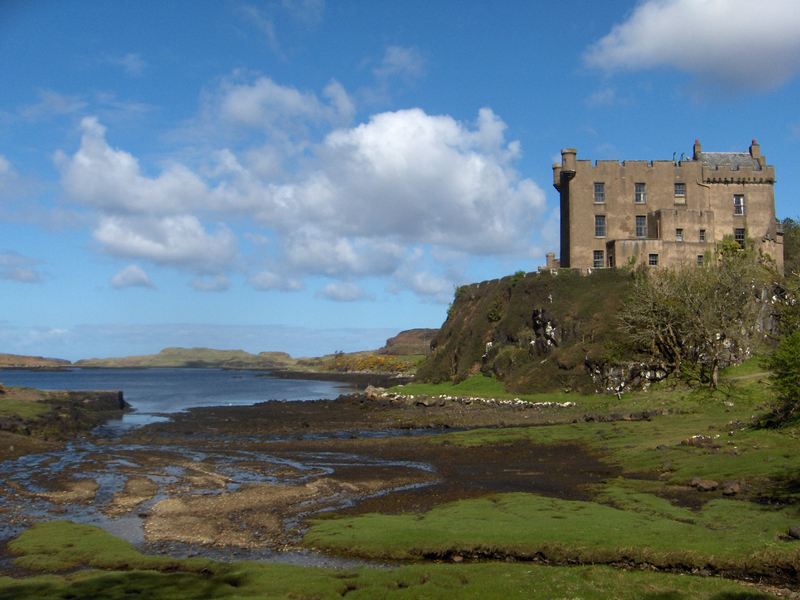 The MacLeod clan had lived in the area of Dunvegan since the 13th century. The keep of the Dunvegan Castle was built in the 14th century, the tower, the 15th century, and the castle's main hall was finished in the 17th century. It's said that the Fairy Flag was first given to a certain MacLeod by his wife who also happened to be a fairy. After twenty years of marriage she had to return to Fairy Land, and the flag was her parting gift. The couple bid their last farewells not far from Dunvegan, at a place still known as Fairy Bridge. The power of the flag was such that whenever the MacLeods were in danger during a battle, and they unfurled the Fairy Flag, its magic would ensure their success in conquering the enemy. Its power however, was limited. It could only be used three times in this way. It has already been used twice. The first time was at the Battle of Glendale (1490). The second time was at Trumpan (1580). On both occasions the MacLeods were victorious. The flag was also supposed to make marriages fruitful, and it was said that its enchantment could bring large shoals of herring into the loch to be easily caught. The Dunvegan Lullaby is a song directly associated with the Fairy Flag. Live thy steeds be, dauntless thy following. Afterwards she wrapped the baby in the Fairy Flag and gently replaced him in his cradle. The baby's nurse had followed the whole scene in amazement. So impressed was she that she remembered the melody and all the words of the lullaby. Whenever the baby was distraught his nurse would calm him by singing the Dunvegan Lullaby which always had its magic effect. Ever since then tradition required that only qualified women who knew the Dunvegan Lullaby would be employed to care for the MacLeod bairns. sLily and her new husband, Ryan, are going to Scotland for their honeymoon. Sometime in July~ I think. Won't they have a marvelous time. They are beginning with Edinborough. Then they will be able to see the Stone of Destiny that the Brits finally returned to Scotland after 700 years.. It's in Edinburgh Castle. (Article coming soon- Scots' myths 12). If they have time they should also go to the west coast around Arisaig. It's beautiful there. 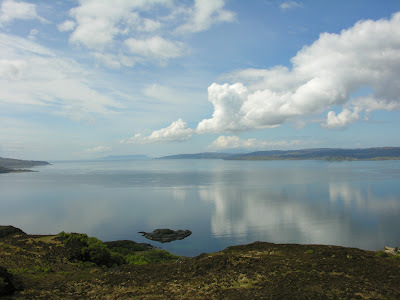 They could then maybe take the boat to the isle of Eigg..